In Wednesday’s minicamp report, I wrote that rookie tight end George Kittle would make more than 50 catches next season. How many catches do you think he will make? How many touchdown do you think he will score? Will he start? Project his rookie stats and explain your projections. The guys a rookie. Don’t set unreasonable expectations on him based on what you see without pads. You’ll make it seem like a failure even if he has a successful rookie season. Well said I agree. 100. 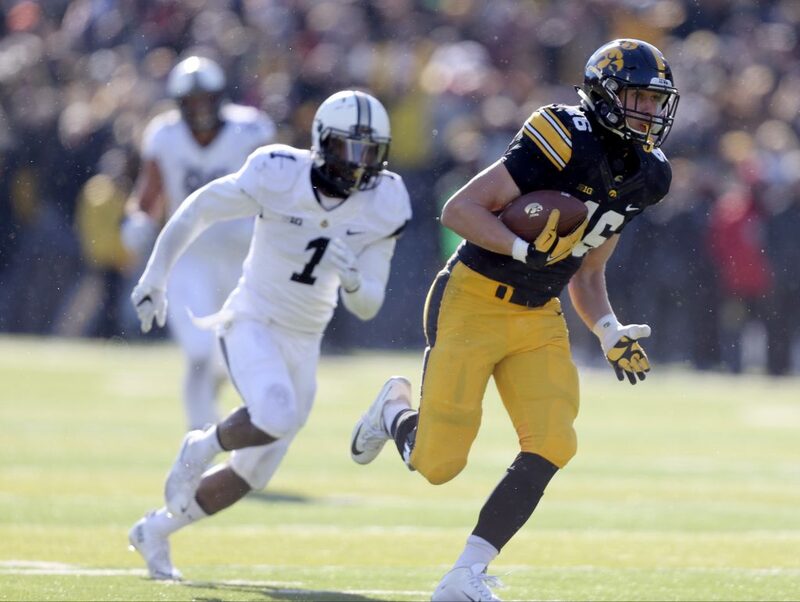 Kittle corn should pop for 35 catches and 4 TD’s if the amount of 1st team reps he received is any indication. This team has lacked a true, consistent seam route threat at TE for years. Maybe since Brent Jones. He’ll start part of a rotation with Paulsen, and Dirty Martini. Shanny likes to spread the ball around, which is why I don’t see him getting 50+ touches…. I’m somewhere between Houston and Razor. I think Kittle will have somewhere between 20-30 catches and maybe 2-4 TDs. remember a guy named Vernon Davis??!! he had 13 td’s in one year……not to mention a 3-4 years stretch where he probably averaged 10 td’s……..and his best route, by far, was the seam!!!! with that said, I loved brent Jones! and he was a great receiving Te! I also remember their rookie years. Do you? See why I’m not overboard on the rookie? That should be 0 TDs for Brent Jones his rookie outing – sorry. Chancellor laid eggs in VD’s brain, and he was never the same. Not quite my point. Rookies very rarely have anything but fairly pedestrian 1st seasons. I don’t expect Kittle to have all pro numbers. I would expect a lot of spreading of the ball this year. I just want a consistent threat on seam routes that doesn’t get Cassie arms when thrown to. Part of that was an inaccurate passer who would put people going across the middle in danger of being walloped. Never the same except the season after Kam hit him when he had 13 TDs. Vance MacDonald level- an easily achievable goal hopefully without the drops. Where does one purchase those cards in Indiana? That’s the only place where they’re legal…other than Missouri of course…. I would think a no way in hell card has to be able to be purchased in Alabama and Texas too!! Pretty sure you can get a No Way in Hell Card in Texas but there’s a registration required and a 3 day waiting period. Guess I’ll need to get registered though. 9 TDs on 25 catches would be insane for a rookie 5th round TE playing with a bad QB. Not gonna happen. When Hell, Michigan froze over, I just KNEW the Niners were going to win their first SB. Maybe you could get a -No way in Hell -card from there. Hey East coast where are you at in Indiana? Not in Indiana at all in NC. I was joking with Razor who is in Indiana. He is a typical blissful. He is probably one of those that swore that we were stacked at corner, oline and wideout last year. No starts, 18 receptions for 177 yards, 4 drops, 1 TD, gets injured 7 games in and goes on IR. You been drinking Pliny with Seb or what? Kittle will get opportunities, but so will Juszczyk. I also expect the RBs will be targeted with swing passes. With WRs garnering throws downfield, the ball is getting spread around a lot. Kittle will get on the field if his blocking is good enough. If not, he should best just study hard and work out to gain strength. He should play on ST, too. Kittle may get 24 catches for 240 yards, and 4 TDs. 20 receptions, 220 yards, 3 TDs. He’ll start 2 or 3 games because of njuries to the vets. But his production will tail off pretty quickly during the season as defensive coordinators figure out that Hoyer can only throw reliably inside the hashmarks, and so they shade into the middle to stop the Niners passing attack, such as it is. Made worse by the inconsistency of the OL, which still needs lots of help, as Hoyer is often forced to hurry his throws. My guess is as good as anyone else so I will give mine. 7.5 per catch average…. after becoming the starter in game 5. He could do more. I mean, a worn out ‘never was’ Tamme wasn’t much of TE in Atlanta. But he did have 59 catches two years ago. But we’ve got “jewels” or whatever his nickname is to compete with some potential receptions. The weaknesses of the WR corps will force Shanahan to target the RBs and TEs more than he’s had to in the past. That said, opponents will flood the middle of the field and attack the Niners OL to exploit the limitations of the offense. Kittle will be in the mix for his share of targets, but he’ll make his share of rookie mistakes, and if he shows a lot of talent, the defenses will smother him. Freemen and Colemen had over 80 receptions alone in 2016 for Shanny’s Falcons, and they certainly were not a weak wide receiving team. Arguably the quality of those Atlanta WRs was one of the reasons the RBs were so effective in the passing game. Defenses had to concentrate on the WRs to prevent big plays — and Matt Ryan was capable of throwing every pass in the book — freeing up the RBs to sop up all those passes as well as do well in the running game. Just a guess that it won’t work quite the same way with the cast of characters the Niners will be putting on the field when they have the ball. 35 plus receptions, 5 – 6 TDs, 300 plus yards. He’ll be in the conversation for offensive rookie of the year. Sure, why not wing it and take a flyer . . .
My guess is they’re going to put him in at QB just to piss off Seb! Seriously? Would that be a Wild Kit formation? Naw, I would be happy to get away from the boring old standard of forcing the QB to be only a pocket passer. I would like to see naked bootlegs, rolling pockets and flea flickers. Maybe Bell could used in an innovative manner. Wonder how many passes has Kittle thrown in his college career? I don’t think any of Atlanta’s TEs had more than 22 receptions around 270 yards and 3 TDs or less. I figure this has to be the high water mark for any TE especially a rookie. That just means that TEs have had for more opportunities to be open In Atlanta. If I receivers are as bad as we think they wont be open and Kiddle will be far more closely guarded and won’t have the opportunities he otherwise might have. Weird. My reply ended up on a different post. Anyway, you could be right about the potential upside. We really only have two decent, proven WRs and one of them is a slot guy while the other is slowing down. I’m expecting a couple big plays from him in garbage time against lesser opponents. The problem with this team is the offense will start off decent but once the league gets the tape on how Shanahan will use our excellent offensive personnel they will easily be able to shut it down. And on defense it will be the opppsite as the defense will struggle for the first half of the year adjusting to a new scheme. They will get better as the year progresses and our talent upfront and in the secondary begins to shine. The league already knows what Shanahan likes to run. But Kyle can run a ton of different plays from different formations. A three TE set that looks like a run could be a play action, or after the D shows their formation, Kyle could send Juice out wide to take advantage. Shanahan has a lot of options. In the running game he has Hyde, Williams, and Hightower, maybe Breida. In the passing game he has Garcon, Kerley, Goodwin, ( field stretcher) Taylor, Juice, Kittle, Hyde, Hightower, and hopefully Williams can become a viable target. Shanny will not be figured out for long stretches. He has too many weapons and different plays for that to happen. Not really. If you look at the Falcons compared to the NFL, they ran slightly more than average (42% to 41%) last year and slightly under the year before (39% to 41%). If you look at their internal rushing splits, in 2016 28% of their runs were in the 4th quarter, whereas the year before (2015), they ran fewer rushes in the 4th quarter because they were often behind (24% of rushes). So all I see is a very standard NFL balance. FWIW, he does like to establish the passing game early. In both years the fewest rushes (under 100 each year) were in the first quarter. You either completely missed my point or you deliberately tried to misrepresent my post. My post was about Shanahan’s ability to keep teams guessing regardless of formation. You are trying to make it seem like I said they will run the majority of the time. You misrepresent people on this site often. You also post stats and act like you are the only one that looks at stats. You frequently say things to the effect of ‘most people don’t know’. Your insecurity is on display for the entire blog to see. You say obvious things like 2+2=4. Well no F’n $hit Sherlock. This dude will be so good that by the 2018 season he’ll sign an endorsement with Skittles to lend his name to Kittles Red and Gold candies. This year tho, 19 catches 181 yards 2 TDs. Are you sure that you aren’t vying for the job to be Kittles’ publicist and business agent? Must admit, you have a good business outlook. But that said, Kittle will need to make a huge splash in the NFL before Skittles looks his way. I think Marshawn Lynch will continue to hold the Skittles torch on the heels of his comeback with the Sin-City Raiders. Early in Montana’s career local media called on fans to provide Joe with a nickname–before he injured his back and was winning his second (and beyond) super bowls. The name that carried the day was ‘Big Sky’, or Big Sky Montana. After lots of ooh and ahh hoopla it died away…rather quickly. We always called him Joe Cool in my neighborhood back in ’77. There’s a Big Sky Drive in Rocklin where the 49ers used to train. Not sure which Montana it is named for though. Is there a (Dan) Bunz Circle in Rocklin? I remember that. That was the least cringe-worthy. There were real bad ones. The worse nick-name (believe it was teammates induced) was Jerry Rice’ “Fifii” …. glad it was short-lived. Best nick-name was “Hacksaw” Jim Reynolds. Since we’re doing a little reminiscing. The best 49ers celebration dance was Merton Hanks. You can’t beat the Hacksaw nickname. Bar None was cool. I never liked the VD nickname because it sounds gross. We always called Jerry Rice the San Francisco treat. I wish they had kept Woody…. They called Todd Shell- Crystal. Remember Dwight Hicks and the Hot Licks? He’ll go the Chunky Soup route with his mother before anything else comes along–if at all. Kittle will start. Kittle will have 40 catches for about 450 YDs and 5 TDs. Those numbers could go higher if Beathard takes over. Hard to say because if it is true that Shanny is going to run and use play action a lot they could be in a lot of 2 and 3 TE sets and the question is which one gets the targets. I would expect that a dominant TE will be established after they get some WRs who can dominate. If our WRs can’t establish a threat, opposing Ds can focus on shutting down our go to TE. Hard to call at this point. We’ve only seen the kid in shorts. How WRs and TEs get separation in live action. Given those unknown variables, I have no idea how many catches or TDs the guy might get. With all due respect, none of us do. Whistling in the dark. I agree with both Whine and Brotha, much too early to tell. George, it IS just idle speculation during the off season, and no more practices for a while. If you want me to change the subject, I have a multi player deal….. Agreed. Like everything else at this point, it’s all guesswork – but it’s an interesting topic non-the-less. Cheap, cheesey & salty but little lasting value. How many felony arrests before TC? I’ve been thinking, maybe it would be a good marketing venture to sign Kaep and start Kittle! You know we’ll have a good time then”……………NOT! And I was going to learn to fly. I took off for the sky. Giving tips, and getting stoned. I heard the screen door slam. And a big yellow taxi. I hope he’ll start because it means we’ve moved on from V- oh geez he dropped it- McDonald. When Shanahan was at the Redskins he had Fred Davis and Jordan Reed at various pounts. Both guys had in the 40 to 60 catch range. In 2014 at the Browns Jordan Cameron had 24 catches in 9 games, averaging 18 ypc. Given the WRs aren’t great I think it is conceivable Kittle gets between 30 and 50 catches if he wins the starting job, even though he is a rookie. But if he gets close to the 50 mark then don’t expect any of the receivers to have great years. Reed caught 45 passes his rookie season. Yep Cassie, a lone, lonely cab ride without a destination. “You reap what you sow”! Kudo’s to Harry! I think the receivers will do a lot better than last season. They actually have speed, and Lynch was smart to sign battle tested and battle hardened FAs. With more PA, that is contingent on them having a decent running game. The Niners signed well, traded well and drafted well, so the RBs should be much improved. The running game will do better because they will employ a lot of 2 TE sets. Kittle may do well in those scenarios, because KS will target Kittle with a LB. That is why I think he will get passes, and also get 4 TDs. It sure was telling to see Kittle run with the first string. However, 50 is way too many to expect from a rookie. As the OL goes, so goes the offense, regardless of (or lack of) fancy skill players. Zuttah was a nice addition to replace the truly underwhelming Kilgore, but it’s hard to see how effective the line will be for Shanahan’s offense to be executed competently. Last year they were awful, terrible at pass protection and routinely getting pushed around on running plays. Their best OL has a better attitude this year, but he’s not getting any younger. Both guard positions are unsettled, and — let’s face it — the RT, god bless ’em, is switching to a completely new scheme for which he isn’t the prototypical physical type. Pretty sure FA and draft next year will focus on OL, QB, WR, and CB/S . I hope they play players in their right position. If Zuttah does not stay healthy, maybe they should put Beadles in at center instead of Kilgore. I sure hope they let Garnett play at LG, his natural position. Maybe Kilgore should play RG. Fusco, Barnes and Gilliam are all wild cards. If he does become the number 1? I say 45rec and a little over 400yds and 6 TDs. Hoyer really liked Zach Miller in CHI, so there is a chance Kittle gets the Red zone touches to get him to 6 TDS. 100 catches 17 TD’s and MVP consideration! These numbers are on my low end and could be higher. As a rule of thumb I like to keep my performance predictions on the conservative side, allowing for pleasant surprises. Depends if and when the other TEs get injured. Vance McDonald will be the #1 starter, as he has proven himself to be a the best blocker and a major red-zone threat. He is also a powerful physical specimen, lightning fast for his size, and always gives 100%. Coaches love his work ethic. Then, 2nd, there’s the guy Lynch signed as a free agent. He’s going to get his reps, for sure. Finally, Kittle will be groomed throughout the season for more and more emphasis. His time will come, but I don’t think he’ll flourish until the 2nd half of the season. Coach Shanahan likes to bring in his rookies slowly, just as he plans on doing with QB Beathard. 20-25 catches 300-325 recieving yards and about 3td which would be a great rookie season for him. Jordan Reed caught 45 passes in 9 games as a rookie under Shanahan in 2013. That’s 5 catches per game. If Kittle makes 4 catches per game, that’s 64 catches. If Kittle can play 9 games as a rookie at 4 catches per game, that’s 36 catches.